PathViewer | Glencoe Software, Inc.
As the pathology imaging field advances, data management solutions need to keep pace. At Glencoe, we are constantly searching for ways to innovate and improve our products. We talk to customers, listen to feedback, and survey the marketplace. The result is PathViewer: an interactive visualization, analysis and annotation tool specifically tailored for digital pathology, and the most powerful, easy to use pathology WSI data viewing and annotation tool available. PathViewer offers multiple magnification options, allowing the user to choose between the mousewheel and keyboard shortcuts. A birdseye view allows you to see where you are zoomed into on the sample. To make the interaction with the data even smoother we offer continuous zoom with the ability to zoom past 100%, allowing you to explore the data in fine detail. Exploring images with a large number of probes can be challenging. To simplify existing visualization workflows and allow creation of new ones, PathViewer lets you organize channels into groups. There are no limitations on the number of channels or the number of groups so you are free to create new visualizations and explore your data however you wish. PathViewer lets you use a formatted image description, a searchable list of text annotations, and as many ROIs as you like. You can generate all annotation types in a web browser, or view and interact with text and ROI annotations added by an analysis tool. Big complex data are easy and fast to access, securely share, and understand. Built to work seamlessly with Glencoe’s OMERO Plus and OMERO from OME, PathViewer is a dedicated solution tailored to support the digital pathology workflow. 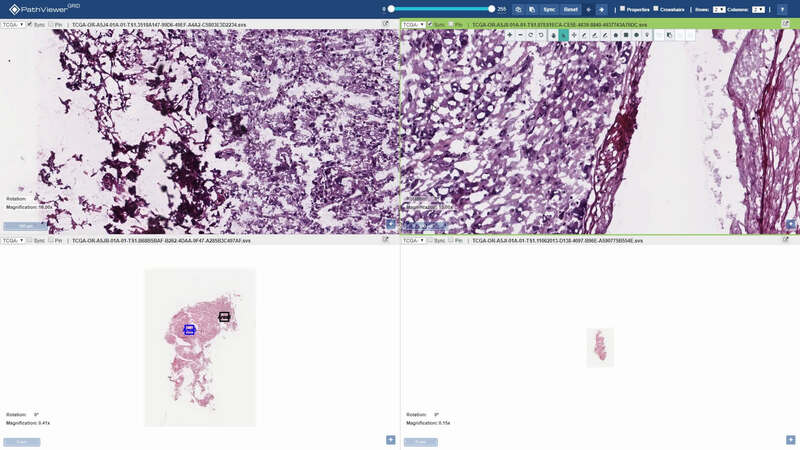 This web browser-based platform agnostic application allows you to visualize, annotate and share pathology images—simply and from anywhere you work. With our Bio-Formats natively supporting over 150 different file formats, you can work with your preferred scanner and favorite analysis software easily. OMERO Plus is designed to support a growing user base and can scale with your business as it goes from 5 to 500+ employees. OMERO Plus is designed and architected to address the challenge of large, heterogeneous data sets regardless of the size of the organization. Edit, update, and experiment with confidence knowing that you have full undo/redo functionality available for all operations. Copy and paste one or more regions of interest (ROIs) either within or between images. No need to install any new software. Connect to your data using your preferred browser, anywhere, anytime. The intuitive interface was designed with the user in mind, providing the essential tools and functionality. Being able to draw polylines, polygons, ellipses, rectangles, and points along with the ability to zoom in and out while drawing enable precision and extra level of detail. Collaborate securely when, how and with whom you want. Multiple users can work on the same image or dataset independently or simultaneously. You control who can access the data and determine who can read, write and/or annotate. Make color and contrast level adjustments, assign specific colors to channels, turn channels on and off, and manage image intensity settings without losing the original data. View the essential details from your acquisition platform with a series of viewing panels which you can toggle on or off with the click of a button. Multiple levels of fast, stepwise zoom are available, as well as rotation to 0, 90, 180 or 270 degrees. Replicate your current view as many times as you like, easily allowing side by side comparison of images. Sharing your exact view with others is as simple as copy and paste. Quickly and easily share a region of interest (ROI) at an exact magnification and with choice of settings. Export your image files and post them on presentations, submit them for publication, and share them with whomever you wish. Our team comprises decades of experience in computational image informatics and our solutions are used in thousands of institutions worldwide to power big image data discovery. We can provide everything needed to accelerate department-wide implementation and successfully move you to a digital pathology environment. Custom linkage to internal electronic lab notebooks (ELN) with the option to create customizable properties is also possible. We provide comprehensive levels of support and service based on your needs. Installation, software and system architecture support as well as performance tuning and monitoring can all be covered. Our dedicated team of professionals will tailor a solution to fit your organization’s needs and keep everything running long after installation. Ready to Talk Digital Pathology?